A fresh coat of paint is one of the cheapest and easiest DIY fixes, but you could spruce up your backyard fence by using paint in a less traditional way. Rather than painting your entire wooden fence white or brown, you can paint a large design onto your fence, like a tree or open landscape. This unique use of paint will totally transform the look and feel of your yard and fence alike, and it will draw attention away from any minor imperfections that your fence has accumulated over the years. Who ever said that all of your recyclables had to make it into the recycling can? Instead, select old soup or bean cans, paint them a bold or subtle color of your choice, and affix them to your wooden fence to serve as miniature flower holders. 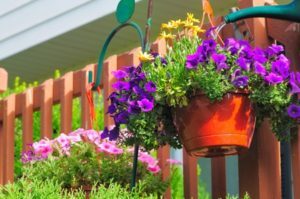 You can plant just one or two flowers in each can, and this simple idea spread across a portion of your backyard fence will look simply beautiful. This is a great technique to spruce up an otherwise uninteresting stretch of fence. If you don’t want to use cans, consider using old rainboots, wine bottles, or any other unlikely household object! Shadow boxes are usually meant for pictures, but you can build or buy open shadow boxes to hang upon your fence and use as attractive shelving for small flower pots and plants. This is the equivalent of hanging pictures on your wall, but this outdoor version will bring new life to your fence and potentially hide any flaws. For more help planning, building, and maintaining your backyard fence, reach out to West Florida Fence in Tampa, Florida at (813) 251-5883. Take a few minutes to talk to one of the fencing experts and obtain your free estimate. You can learn more about the fencing options available for your property and begin the process of transforming your entire yard.